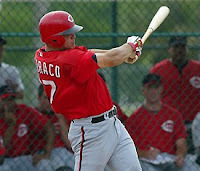 Devin Mesoraco was part of the new Reds draft philosophy, which placed renewed emphasis on players at premier positions. Mesoraco was drafted with the 15th overall pick in the 2007 draft to fill the gaping hole behind the dish that has plagued the Reds over the past decade or so. Mesoraco was drafted on the basis of his impressive athleticism and raw tools, but he needs to continue to refine those tools into baseball skills. 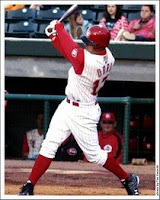 After spending the 2007 season in the rookie Gulf Coast League, the Reds kept Mesoraco in extended spring training to begin the 2008 season. Early speculation was that he would be sent to the rookie Pioneer League, but Mesoraco showed enough in extended spring training to convince the Reds to send him to low-A Dayton. Mesoraco immediately justified the organization's confidence in him by hitting .286/.357/.444 in 70 plate appearances in May. He performed well at the plate in the first three months of the season, but he tailed off badly in August, in which he posted a lackluster .216/.266/.307. Obviously, the physical strain of his first full professional season caught up to him in the dog days of summer, but it was a fairly successful year for Mesoraco. Overall, he posted a line of .261/.311/.399/.710 with 13 doubles, 1 triple, 9 homers, and a 64/20 K/BB ratio in 331 PAs. His components weren't bad either, as he hit line drives 14% of the time and had a BABIP of .304. Ideally, he'll increase his line drive rate and decrease his 51% GB% as he continues to gain more experience and physical strength at the professional level. While some have been disappointed in Mesoraco's 2008 season, it's important to put it in the proper context. To start, the development curve for a high school catcher is long and arduous. Catchers have to learn the nuances of calling a game, familiarize themselves with the pitching staff, and in their free time squeeze in time to learn how to hit professional pitching. It's a challenging development curve and, not surprisingly, catchers frequently move much more slowly up the ladder than other position prospects. So, even in the best of circumstances, a high school catcher is looking at a long development process, but there are two other factors working to lengthen his development curve even further. 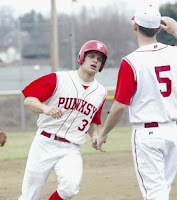 First, Mesoraco played high school baseball in Pennsylvania, which is a cold weather climate. Simply put, players who attend schools in cold weather climates simply don't get the opportunity to play as much baseball as those who attend warm weather schools. Second, Mesoraco was forced to undergo Tommy John surgery as a sophomore in high school, so he missed considerable development time during the injury and subsequent rehabilitation. Not only was Mesoraco already facing a lengthy development curve due to the position he played, but it's likely to be even longer due to the game experience he lost because of injury and cold weather. Clearly, Mesoraco has a long road to travel to the majors, but placing too much emphasis on his early struggles may ultimately prove to be shortsighted. Last year's report discussed his hitting mechanics and his active lower body action. As an amateur player, Mesoraco utilized very little forward stride, choosing instead to lift his front foot up and placing it right back down. In order to get his weight moving forward to meet the pitch, Mesoraco would transfer his weight to the front foot when the pitcher began his delivery and then transfer the weight to the back foot as the pitcher got closer to releasing the ball. This mechanism allowed him to load up for the swing and get his weight moving forward without much of a forward stride. At the professional level, it seems that the Reds have worked to eliminate some of this back-and-forth weight transfer technique. Mesoraco has quieted his lower body and increased the length of his stride, which may help lessen his tendency to get too far out on the front foot. Mesoraco has good natural strength, but it hasn't translated to homerun power at the plate. Mesoraco has good tools, but he's still raw at the plate and will need to continue working on his swing and approach. You can compare the MLB draft video for Mesoraco with the above youtube clip. This offseason, I've actually been taking a more in-depth look at catching prospects, which was inspired in part by a recent write up by John Sickels in which he reviewed his past rankings of catching prospects to see how their respective careers turned out. One of the phenomenon he identified was what he called "Young Catcher Stagnation Syndrome." As he states, it's more of a description than an explanation, but the theory is that young catchers frequently fail to develop offensively because of the physical stress of playing the position. While it's definitely too soon to see it happening with Mesoraco, it's something to keep an eye on. Especially in light of Mesoraco's thumb injuries, which is the type of problem that could crop up again and hinder his development at the plate. On the plus side, Sickels found that the best young catchers in the Majors today, Joe Mauer and Brian McCann, were drafted out of high school. 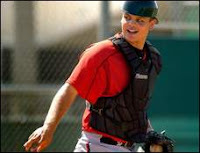 Of the ten best catchers in baseball, only Chris Iannetta and Kurt Suzuki were college draft picks. So, it's possible that there are advantages for catching prospects who get into the professional ranks as early as possible, because the development curve for catchers is quite long. However, it may be nothing more than a small sample size, as Matt Wieters and Buster Posey are on the horizon and both were selected out of the college ranks. Another interesting issue that I've noticed that can hinder catcher development is bad body weight. Perhaps due to the unique physical demands of the catcher position, it seems that young catchers have a greater tendency to add weight to their lower half. Obviously, to withstand the rigors of catching and the toll it can take on the knees, it's important to have strong leg muscles. However, more than any other position, it seems that the weight that catchers add ends up in the lower body. It's bad body weight because it can rob them of agility and quickness. The legs get thicker and heavier, which reduces lateral movement behind the plate, slows footwork on throws, and, quite simply, seems to rob them of some explosiveness. Below, you can see Mesoraco in high school in the photo on the left and with the Dayton Dragons in 2008 in the photo on the right. Now, quite obviously, everyone is going to fill out after high school, so it's hardly unexpected. However, some scouts think he added some bad body weight in 2008 and these pictures do reveal a somewhat stockier Mesoraco. Projecting players is difficult enough as it is, but factoring in physical development adds yet another layer of unpredictability to catcher projection. It's too soon to definitively state that this will be a problem for Mesoraco, but it's something that bears watching, especially since he was highly touted for his athleticism and anything that would diminish it is detrimental. Mesoraco is an interesting prospect, but one with both potentially significant positives and negatives. The question is what will win out? His raw athleticism and myriad of tools? Or, his inexperience, injury problems, and lower body weight? It's far too soon to tell, as the development curve for high school catchers is longer and more volatile than that of any other type of baseball prospect. When he was drafted, I thought Mesoraco's ceiling was that of Russ Martin, but he already seems to have lost a bit of explosiveness. His upside is still considerable, but he'll need to make some adjustments in 2009 in order to continue to climb the ladder. That said, his work ethic is solid and his makeup is good, so he has the intangibles needed to refine his game and reach his ceiling. Mesoraco's upside is considerable and he has all the tools to be an All Star, so for now he checks in at #7 on the list. Danny Dorn is a hitter. Plain and simple. With each swing of the bat, Dorn is forcing the Reds organization and baseball experts across the country to sit up and take notice. Oddly enough, neither group seems to be very willing to do so, as Dorn didn't receive an invite to Spring Training or much ink from the baseball pundits. It seems that Dorn will have to drag the doubters, inside the organization and out, with him all the way to the majors. Another year, another unheralded .900+ OPS for Dorn. If this continues, it'll join "death and taxes" as one of the few certainties of life. 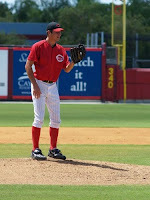 Except for a brief rehab stint at high-A Sarasota, which came after he cut his leg on a sliding catch, Dorn spent the vast majority of the 2008 season with the double-A Chattanooga Lookouts. For the Lookouts, Dorn posted a stellar slash line of .277/.367/.539/.906. He also ripped 21 homers and posted an 84/42 K/BB ratio. As per usual, it wasn't luck driven, as his component stats (18% LD and .312 BABIP) are right in line with his overall level of performance. In addition, Dorn continued to absolutely maul right-handed pitchers to the tune of .290/.379/.592/.971 in 255 ABs. As with many young left-handed hitters, Dorn struggled against the southpaws, posting a .235/.330/.370/.700 line in only 81 ABs, but that's hardly surprising. Coming up the baseball ranks, hitters just don't see many quality southpaws. However, the higher up the ladder a hitter climbs, the more quality lefthanded pitchers he will face. It's far from an impossible task for a good left-handed hitter to improve against southpaws with more experience, so, at this point, I really wouldn't consider his platoon splits to be cause for concern. On the plus side, his on-base skills remained strong, as his Isolated Discipline was a robust .095. Overall, he really doesn't need to improve all that much against southpaws to be competent. Dorn's lofty perch on this list is attributable solely to his tremendous hitting ability. Last year's write up on Dorn covered his mechanics, but a swing like his warrants a bit more discussion. Part of the goal of these write-ups is to breakdown the prospect's mechanics to see if there are any flaws that will hinder his performance as he climbs the ladder. However, in Dorn's case, his swing is pretty much without flaw. It is very fundamentally sound. Even if given the opportunity, I wouldn't change a single thing about the swing in the photo to the right. He has a strong foundation, great balance, his lower body is in sync with his upper body, his head is down on the ball, and he keeps both hands on the bat on the follow-through. The old saying that "a picture is worth a thousand words" rings true in these kinds of write-ups, because everyone once in while you come across a picture that really reveals something about a player. Looking at this picture, you wouldn't need to know anything else about Danny Dorn to know that he can hit. Dorn stands tall with a slightly wider than shoulder width stance. He has a very quiet pre-pitch approach and waits calmly for the pitch with slow bat waggle and a high back elbow. In fact, his whole hitting approach is very calm and really seems to be comfortable waiting for the pitch to come to him. As the pitch is delivered, Dorn takes a very small stride forward to get his weight moving forward. His swing is short and compact, which makes him very quick to the ball, as a result, he has no problem handling even the best fastballs. In addition, his short path to the ball enables him to let the ball travel deeper and take a split second longer to read the pitch, which allows him to really control the strikezone. He can effectively turn on inside pitches, but he has also become adept at taking the pitch to the opposite field. When Dorn does fire his swing, his lower and upper body work well together and remain in sync. In addition, the tempo of his swing is very smooth. When a hitter has both good balance and the upper and lower body work in tandem, then the overall swing is likely to be something special. Dorn's swing really doesn't contain any wasted motion, as it's the baseball embodiment of "economy of movement." Finally, I love that he keeps both hands on the bat during his follow-through. By and large, what you do after the bat passes through the hitting zone makes little difference, unless of course your top hand comes off so quickly that it prematurely decelerates the bat. Even so, I do prefer a two handed follow through (perhaps for aesthetic reasons more than anything else), but it does ensure that his his swing will remain compact and controlled throughout. Obviously, the baseball media put more weight on Dorn's other skills, which fall well short of his hitting ability, than his prowess at the plate in determining his overall value. In leftfield, Dorn is average at best, but he has added some versatility with increased playing time at first base. As of now, he can be competent at either spot. His arm strength is average at best. He throws from a high three-quarter arm slot, which results in his throws tailing off to his arm side and works to rob his throws of carry. However, his arm would certainly pose no problem at either first base or leftfield. Dorn's foot speed is a notch below average and he lacks first step quickness, which means he isn't much of a threat on the bases and lacks range in the field. The other issue that requires a mention is Dorn's injury risk. So far in his professional career, Dorn has suffered from some nagging injuries, but they haven't slowed him down at the plate. Ideally, he'll improve his durability as he climbs the ladder. You can find his MLB draft video here. Dorn is an interesting prospect. In my mind, he's underrated by all the major baseball media, but I'm sure some will feel that this is too high. And, maybe it will be, but given that Dorn excels in the most important area for a position prospect, I don't think it's too high. Juan Francisco is getting rave reviews and a lot of hype for his recent exploits, but if, as seems inevitable, he does end up moving to first base or leftfield, then should he rate higher than Dorn? Dorn has put up back to back seasons of .900+ OPS at double-A, while Francisco has yet to post an .800+ OPS at any level. While Dorn's other skills certainly aren't anything to write home about, his ability to hit for average, get on base, and hit the ball out of the ballpark lands him at #8 on the list. While Juan Francisco's recent performance has him rising to "blue chip prospect" status in the minds of many, a combination of factors actually has him falling in value in my mind. At this point, there doesn't seem to be all that much upside left with Juan, as he has proven himself to be a two tool player (power and strong arm), which limits his overall projection. 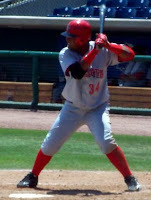 The Reds sent Juan Francisco to high-A Sarasota for the entire 2008 season. After posting a solid 2007 line of .268/.301/.463/.764 at low-A Dayton, Francisco followed up with another solid line of .277/.303/.496/.799 in 2008. He cranked 23 homeruns in a challenging environment for hitters. In addition, Francisco demonstrated an improved line drive rate, jumping from 13% in 2007 to 21% in 2008. Unfortunately, the solid batting average and power came at a cost, as he posted a horrendous K/BB ratio of 123/19 and he struck out once every 4.2 ABs. Francisco also made the decision to scrap switch hitting and focus strictly on hitting from the leftside. Obviously, the decision paid off, as he hit for a good average and very good power. Unfortunately, hitting from only the left side didn't improve his contact or walk rate. Here's a video clip of Francisco at the plate. He utilizes both a wide spread stance and an open stance at the plate. He also has a big bat waggle in his pre-pitch stance and some length to his swing, which is due in part to his long arms. As he hustles down the line you can see his slightly stocky build and the problems that additional weight gain will likely cause. After a solid season high-A Sarasota, Francisco joined Gigantes del Cibao to play in the Dominican winter league. His performance opened more than a few eyes, as he posted a slash line of .360/.419/.665/1.084 to go along with 12 homeruns and a 34/12 K/BB ratio. However, it's important to put his performance in the proper perspective. The Dominican Winter league is widely regarded as having had very poor pitching this season, which is why offensive numbers are up across the board. This provides a bit more context for Francisco's performance and makes it less impressive than it appears at first glance. More than anything, it seems to be Francisco's performance in winter ball that has people talking, but at this point I'm not sure it's quite justified. He clearly got a significant boost from watered down pitching and has yet to post an .800+ OPS season in his professional career. In my mind, the combination of factors that are beginning to decrease Francisco's value are 1) Plate Discipline and 2) Positional Value. Individually, neither would be an insurmountable problem, but when combined they are a substantial drag on Francisco's value. The elephant in the room that can't go without comment is Francisco's horrendous control of the strikezone. It's almost indescribable just how bad it is. In 1,268 minor league At Bats, Francisco has walked only 48 times and struck out 327 times. That works out to be one walk every 26.4 ABs and one strikeout every 3.9 ABs. Not the kind of ratios you want to see out of your prospects. It must be said that it's entirely possible to be a successful big league hitter despite having little ability to control the strikezone. In 2008, Juan Francisco had a BB/K ratio of .154, which would have qualified for worst among all qualified MLB regulars behind Kevin Kouzmanoff, Carlos Gomez, Adam Jones, Jose Guillen, and Corey Hart. Obviously, those players aren't without value, but what they aren't is first basemen. And, ultimately that may be where Francisco ends up. Players like Gomez, Jones, and Hart have a much broader set of skills and play much more valuable positions than first base. The positional value of a player like Adam Jones or Carlos Gomez allows them to get away with poor strikezone control. It's a lot easier for a player in a premier defensive position to succeed with a flawed offensive approach than it is for a first baseman, because a first baseman's value is driven almost exclusively by his bat. Players in premier defensive positions typically have enough secondary skills (defense, speed, etc.) to offset their poor control of the strikezone. However, that's rarely the case for first basemen, who have to hit and hit well to keep their jobs. In 2008, Francisco played primarily at third base, but the Reds are facing a logjam at the hot corner. Edwin Encarnacion continues (for reasons beyond my comprehension) to start at third at the MLB level, while Neftali Soto and Todd Frazier are both in the mix for the third base jobs in the system. Ultimately, something has to give and it may well be Francisco, who is beginning to profile better at firstbase. A reality that becomes more likely as Francisco continues to fill out. I've read reports recently indicating that Francisco has added some bad weight to his lower body, which won't help his already below average range. If Francisco ends up at firstbase, then not only is the value of his power bat diminished, but his only other plus tool is completely negated. Francisco has a very strong arm, but for obvious reasons that just isn't very valuable at first base. At first base, Francisco's offensive game will have to carry him and he just doesn't have the complete offensive skills to be a valuable first baseman. Hitting is made up of three things: 1) batting average, 2) on-base percentage, and 3) power. To hit for a high average, you have to make contact at a good clip: Francisco doesn't. To have a high on-base percentage, you have to have a selective approach: Francisco doesn't. To hit for power, you have to have strength and loft in your swing: Francisco does. So, Juan has only one of three hitting skills at a position that requires at least two. Not surprisingly, there just aren't many MLB first basemen who exhibit poor control of the strikezone and those who do typically have the ability to hit for a high batting average. Unfortunately, Francisco's high strikeout rate likely will preclude him from hitting for a high average, which would leave him with just the ability to hit for power. Perhaps the best MLB comparison for Juan Francisco is Kansas City Royal Mike Jacobs: a low contact, poor plate discipline, good power first baseman who just isn't all that valuable and likely won't hold onto a starting job for very long. Ironically enough, Francisco's value may be at an all-time high, but there's also a good chance that it'll never go any higher. Realistically speaking, he's staring a detrimental position change in the face and just doesn't have the hitting skill-set to sustain his value after such a move. Now might be the ideal time for the Reds to consider dealing him. Overall, Francisco still has value, but there are a number of red flags that drag down his upside. For now, he checks in at #9 on the list. Kyle Lotzkar's 2008 season was probably one of the least surprising in the entire system, in fact he did almost exactly what I thought he'd do. Of course, that description carries with it both positive and negative connotations. On the plus side, he demonstrated the flashes of brilliance that we have already come to expect from his young right arm. Unfortunately, on the downside, he suffered a not altogether unexpected arm injury, which prematurely ended his season. It's still too early to tell, but his 2008 season may be indicative of his entire career. He has the ability to be a top of the rotation starter, but he also has some issues with his mechanics that increase his injury risk and could prevent him from reaching his impressive ceiling. For Lotzkar, it will continue to be a battle between high performance upside and heightened injury risk. Hopefully for Reds fans, the former will win out over the latter. After a very strong 2007 debut, the Reds opted to keep Lotzkar in extended spring training to start the season. Given his age, they likely didn't want to throw him right into the mix against more advanced competition, but he was also dealing with a sore neck which ensured that the Reds would be cautious with him. Lotzkar stayed and worked out in extended spring training until the beginning of June when the Reds sent him him to low-A Dayton Dragons. For the Dragons, Lotzkar demonstrated the kind of high-end performance that makes him a very intriguing pitching prospect. He made his Dayton debut on June 13, which was the first of 10 starts he'd make on the season. Lotzkar pitched 37.2 total innings which of course works out to only 3.2 innings per start. Given his high walk and whiff rates, it's not surprising that Lotzkar never worked past the 5th inning, as both of those outcomes require a lot of pitches. In his 10 starts, Lotzkar posted a 3.58 ERA, 1.41 WHIP, 5.7 BB/9, 12.0 K/9, and a 0.74 GB/FB ratio. And, a look at his component stats indicate that he was as good as his ERA indicates. His FIP was 3.65 and his BABIP was .321. Unfortunately, when Lotzkar toed the slab on August 3rd against the Quad City River Bandits it would be his last outing of the season. He worked 2.2 innings before injury struck and he was forced to leave the game with a small stress fracture in his elbow. Fortunately, Lotzkar's stress fracture was a small one, even so it's a rather unusual injury for a pitcher. In short, a stress fracture is an overuse injury that is frequently seen in athletes. A fracture, or broken bone, is typically caused by very high force that causes the bone to break. However, a stress fracture is caused by a much lower level of force that happens repetitively over a long period of time. What makes it an unusual injury for Lotzkar is that stress fractures are most often seen in the bones below the knee (i.e. shin bones, bones of the foot, etc). Stress fractures in the upper body are rare because the weight of the body is not supported by the arms the way it is by the legs. A good example of a lower body stress fracture is fellow Cincinnati Red Chris Dickerson, whose 2008 season ended when he had to have surgery to remove a piece of bone from a stress fracture in his left ankle. Stress fractures are usually seen in athletes who increase their level of activity over a short period of time. In Lotzkar's case, he was working his first full professional season and throwing more than he ever had in his baseball career. Typically, bones will adapt to increased workload by becoming stronger in the high stress areas, but a stress fracture may result if the bone cannot maintain the pace of the repetitive work. The typical treatment for a stress fracture is rest, but more serious fractures can require corrective surgery. Recently, former Baltimore Oriole pitching prospect Adam Loewen was forced to give up pitching after suffering a recurring elbow fracture. Loewen originally suffered the stress fracture in 2007 and had corrective surgery that inserted a screw to stabilize the joint. Only recently tests revealed that he had reaggravated the fracture, which had widened again. 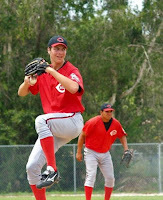 Ultimately, Loewen decided not to have another corrective surgery which would keep him out until 2010, but to instead give up pitching to focus on converting to the outfield. Seattle Mariner pitching prospect Cesar Jimenez is another prospect who suffered a stress fracture of the elbow. He opted for surgery and missed most of the 2007 season. Upon his return, the Mariners shifted him to the bullpen in part due to questions about his durability. Even so, he is throwing the ball well and should have the opportunity to pitch out of the Mariner bullpen in 2009. 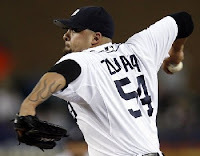 A couple of other pitchers suffering from stress fractures are Yankee pitcher Jonathan Albaladejo (elbow) and Tiger flamethrower Joel Zumaya (shoulder). Fortunately, Lotzkar's stress fracture, which only required rest, was not as serious as Loewen's career ending injury. After resting his elbow for just a month, Lotzar was throwing again without pain. All in all, this could be nothing more than a very minor bump in the road for Lotzkar, but it certainly bears watching. Hopefully, there won't be a recurrence of the injury, because, as Adam Loewen demonstrated, it can pose a serious threat to a pitcher's career. Lotzkar features three quality pitches: a 90-93 mph fastball with good movement, a biting curveball that he has tightened up, and a developing change-up. He has a good feel for pitching, which helps his pitches play up a tick, and he's comfortable throwing all of his pitches. His biggest problem is his control, as he issues a lot of free passes, which really isn't surprising given his age. Fortunately, that's a problem that can be corrected with experience and improvement would really unleash his potential. As for his mechanics, Lotzkar still has a red flag in his delivery. He has a fairly loose arm action, but he brings his pitching elbow up above shoulder height after breaking his hands (see Zumaya photo, who shares both the high pitching elbow and "coincidentally" the stress fracture injury), which can increase the stress on the arm. Given the heightened risk of injury created by his delivery, it's not surprising that he suffered an arm injury during his first full season. Hopefully, it's not a sign of things to come. Overall, the only real drawback on Kyle Lotzkar is the risk of injury. Outside of that, he's got the body type that scouts dream on, the pure stuff to be a dominant pitcher, and a good feel for pitching. In addition, he seems to have good makeup and a strong work ethic, which are underrated attributes in prospects. Lotzkar has tremendous upside and injury might be the only thing that prevents him from reaching it. It's also the only thing that prevents me from ranking him much higher on this list. For now, he checks in at #10.